This is a classic ceramic coffee mug in silver with light accents of metallic. 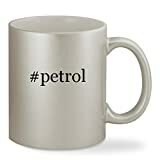 This entry was posted in Gardening Equipment and tagged 11oz, Ceramic, Coffee, Hashtag, Petrol, Silver, Sturdy by Lawn Advice. Bookmark the permalink.